Dashbot is excited to welcome and support VoiceLabs Insights users as VoiceLabs transitions out of analytics, and Dashbot continues to grow in this space. 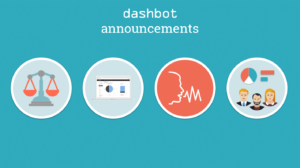 Dashbot has provided cross platform analytics for developers building Alexa Skills, Google Actions, Facebook chatbots, and other conversational interfaces since 2016, and has processed more than 23 billion messages to date. VoiceLabs will formally discontinue VoiceInsights, their voice analytics product, on March 29, 2018, giving existing users time to export and migrate their data. The VoiceLabs team selected Dashbot as a preferred partner for VoiceInsights customers to migrate their data and begin using promptly. Dashbot is the leading analytics service that supports all conversational interfaces by providing advanced reports and premium tools for developers and brands alike to understand and optimize the bot user experience. Dashbot is excited to welcome VoiceLabs customers and provide resources and support to make the transition seamless so that new users can have immediate access to conversational analytics and tools. Dashbot has built a simple importing tool so VoiceLabs customers can easily transfer their conversational products and data, which will remain perfectly intact during this transition. New customers will have complete access to the full suite of Dashbot reports and tools to continue building, understanding, and optimizing their applications. This transition is timely given the growth and development of third-party apps and tools that voice platforms have recently announced. In December 2017, Alexa surpassed 25,000 Skills. More notably, at CES, Amazon announced that they added Windows 10 PC to the lengthy list of devices that will support Alexa and fight for voice share with Cortana’s 141 million monthly users. The Google Assistant also made its mark at CES with the announcement of integrations with several hardware partners including JBL, Lenovo, LG and Sony. The conversational interface space continues to rapidly grow, and Dashbot is in a prime position to help developers and brands build optimal user experiences as they invest more resources into this space. For instructions on how to export your data and import it to Dashbot, please visit: https://www.dashbot.io/voicelabs. Dashbot is the leading conversational analytics platform that enables developers and brands to increase engagement, acquisition, and monetization through actionable data and tools. In addition to traditional analytics like engagement and retention, we provide bot and voice specific metrics including sentiment analysis, conversational analytics, and full chat session transcripts. We also have tools to take action on the data, like our live-person takeover, broadcast messaging, and goal funnels. Dashbot was founded in April 2016 by serial entrepreneurs Arte Merritt, an MIT alum who sold his previous mobile analytics company to Nokia, Jesse Hull an MIT alum who sold his startup to Game Show Network, and Dennis Yang a Cornell alum who sold his previous company to eBay. Dashbot is funded by ffVC, Bessemer, Samsung Next, BDMI, Scrum Ventures, Rembrandt, Recruit, and R/GA.